Electric karts? Yes, the greenies have found their way into the grass-roots of motorsport (forgive the pun!) and battery-powered karts now whizz silently around the Revolution kart circuit in London's Docklands. It's not as daft as it seems either. The powerful motors give excellent acceleration and heavier drivers do not suffer from the usual problems associated with petrol engines. 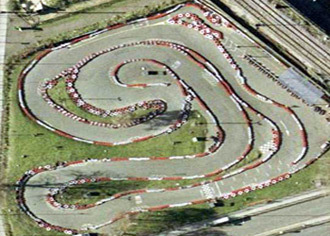 A range of race formats are available with good conference facilities and catering on site as well as a kart club for the kids. Central, District and Hammersmith & City lines. Nearest station Mile End. Turn left out of station and left again at traffic lights into Burdett Road. Revolution Karting is 5 mins walk on the right hand side just before the railway bridge. Nearest station Limehouse. Right at the stairs, cross over Commercial Road and go right. Under the bridge turn left down Yorkshire Road. At the T- junction turn right onto Salmon lane - continue 3-5 mins until Road forks - take the left road (Rhodeswell Rd) continue round this road - over mini roundabout until you reach traffic lights. Cross over & turn right - keep going - track is on your left - alleyway on left down side of track going under the arches, turn right and walk down to the office door (entrance). A 60 minute race of heats and finals for 10 to 100 people. An exclusive event for 30 or more drivers, including midday food. A choice of 3 conference rooms are available at this circuit. Contact us for more details. There are conference facilities for 100.